However, on your next North Georgia getaways vacation, you can come close to experiencing flight like a bird by scheduling a zip lining tour for your family. 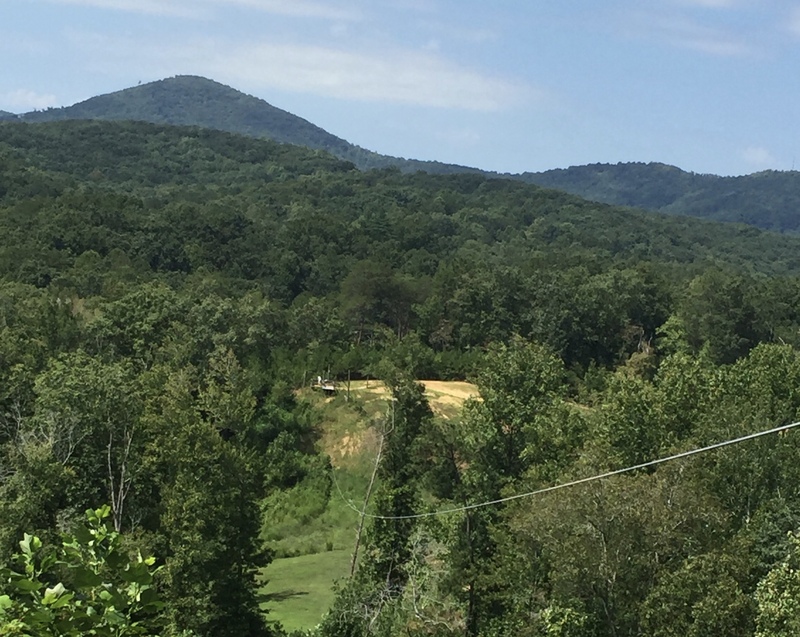 Many zip lining tours offer different views of the North Georgia Mountains and are close to the luxury cabins in Helen, GA.While zip lining through the mountains of North Georgia is a great way to add to the enjoyment of your cabin rental in Helen, Georgia. We thought you might want to learn a little more before taking flight. 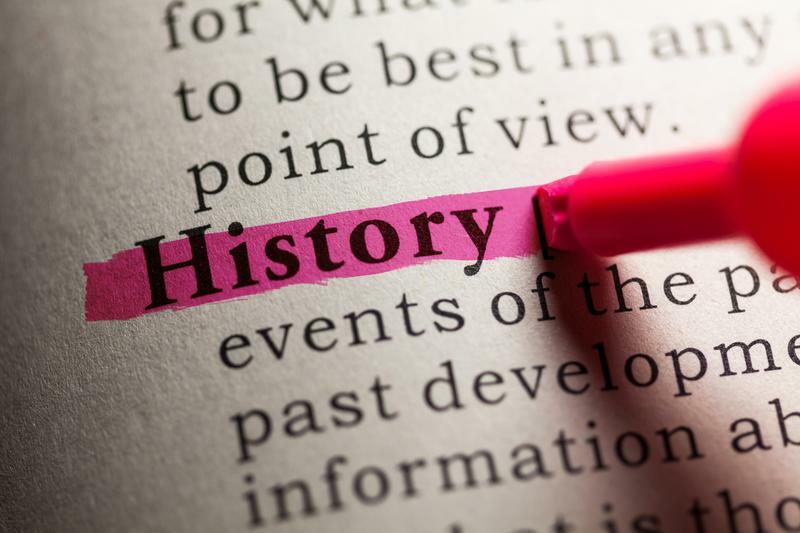 How much do you know about zip line facts, history, and safety? Zip lining may seem like a modern-day sport, but the first known reference to zip-lining for pleasure was in "The Invisible Man" by HG Wells. The story was published in 1897, and the zip line was an amusement ride at a fair. Modern-day zip lines were started to make the remote areas of Central America were accessible to scientists. These tropical forests are nearly impossible to traverse quickly and safely. Zip lines allow the scientists easier access. Zip lining isn't just a thrilling adventure, it is also a reliable way of transporting both people and goods across waterways, canyons, and gorges. A zip-line can be designed and built to accommodate specific transportation tasks. Mountaineers use a similar method of traversing an open space called a "Tyrolean Traverse." This allows climbers to cross on a rope secured between two different points. Before you depart your cabin rental in Helen, GA, take a few minutes to prepare for a safe ride. Ensuring the safety of your group will help you have as much fun as possible as you zip through the North Georgia mountains. Choose a reputable operator. Before you make reservations take time to read reviews online, ask the operator any safety questions you may have, and ensure the operator is fully insured. 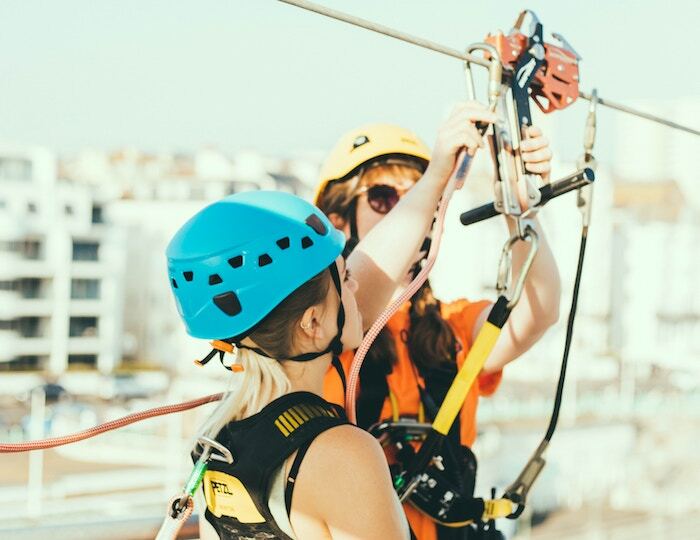 Wear all safety equipment provided and ensure that the harness is fitted correctly. Ask your group's guide to double check that all of your gear fits properly and is in full working order. Never use any personal equipment on the zip line. Pay careful attention to the pre-ride instructions from the guide. Ask any questions you may have about safe riding procedures and braking methods. Carefully follow the limits the operator has in place for age and weight of a rider. Dress appropriately for your zip-line tour. Socks and closed toe shoes are recommended as well as full-length pants or long shorts. If you have long hair, tie it back and remove any loose jewelry. Don't force anyone to ride the zip-line if they are uncomfortable or frightened, especially children. Scared or crying children risk their safety as well as the safety of the tour guides. If any equipment you see on tour looks damaged or unsafe, don't ride. Report what you've seen to the guide so repairs or adjustments can be made. Choose the excursion that suits you best from three fun options at North Georgia Canopy Tours. The Adventure Tour involves over three hours of zipping across twelve different lines, three nature walks, two sky bridges, incredible views of northern Georgia and the North Oconee River, as well a rappel. The end of your trip will include a super fast 695-foot dual zip across Hilltop Pond. The Premium Adventure Tour involves all of the fun of the Adventure Tour but allows you to take the experience home with you as your excursion will be photographed and videoed. For those with a little less time to spare, a shorter Sky Bridge Tour may be the best option. But don't worry - you will still be able to have plenty of fun on nine zip lines, two sky bridges, two nature walks, and the big zip over Hilltop Pond. 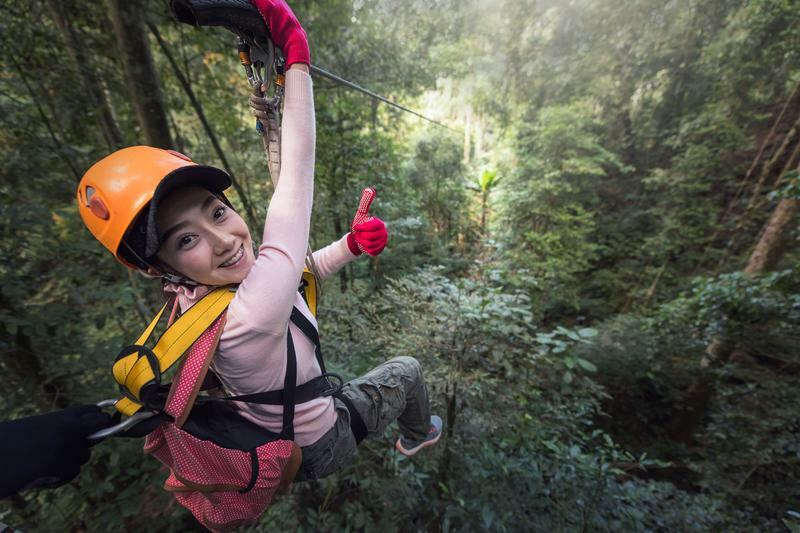 This tour company's zip-lining adventures are full of non-stop fun. You’ll find North Georgia Canopy Tours in Lula just a short drive from your Georgia getaways, mountain cabin. Situated on 34 beautiful acres on the North Oconee River, tours are available year-round during daylight hours. Make sure to check the specific times of each day's first tour on the website. North Georgia Canopy Tours offers two primary zip lining tours. Lake Lanier is located just a bit south of your cabin. Helen GA tourists often like to make a visit to this area, and when they do, they check out their canopy tours. Among the more popular of their packages is the Pine Isle Tour which takes visitors on a three-to-four-hour adventure across eleven separate zip-lines, sky bridges, spiral staircases, and more. This tour offers incredible views of the lake and even has dual lines specifically designed to enable riders to race against one another, side by side. See if you can spot some of the wildlife indigenous to the area, such as bald eagles, deer, fox, and more. And don't forget to come back after dark for the Moon Shine Tour. The silvery moonbeams across the still waters of Lake Lanier make this one well worth the trip. Sunburst Stables is another hot spot for those staying in a lush cabin rental in Helen GA. Located just moments away from your vacation rental's door, the stables offer much more than just horseback riding. You will find that the zip-line tours available here will provide thrills for your entire group. At Sunburst, visitors receive their training with a more "hands-on" approach. And, with dueling zip lines you can race a friend to the bottom to end your tour. But pick your line carefully; one of the dueling lines zips to the base through the fountain of fun, and the other stays dry!The first 400-foot "Sea Leg" zip-line is designed to show new riders the ropes and is used to instruct them on the do's and don'ts of a canopy tour. Next, you'll set out on the Sawmill zipline which will take you to the only cave zip-line tour in the horseback riding area. A 700-foot line takes visitors into the entrance of a gold mining cave and allows them to ride 200 feet through darkness instead of a walking cave tour. You'll enjoy gorgeous valley views and fresh mountain air before finally making your big splash in a pond at the end of your journey. If you're looking for a true canopy zip lining experience, you don't want to miss the Blue Ridge Canopy Adventure. This adventure spans a mountainside as you zip through the layers of trees and eventually to the forest floor. Choose from thirteen different zip-line tours from 150 to 1,000 feet long and seven tours from 150 to 550 feet long. Check out Blue Ridge Canopy, and you be the judge on the best one for you! What do you get when you combine the excitement of a zip-line with a little bit of local history? A one-of-a-kind adventure! Zip in Time at Nacoochee Outdoor Adventures creatively combines the local landscape with historical stories of the North Georgia mountains to provide an educational and fun zip-line tour! Conveniently located in the Nacoochee-Sautee Valley, Zip N Time offers fun and affordable adventures for the entire family. The zip lining tours provided by Zip N Time are unlike any other in the mountains of North Georgia. More than just a trip down a zip line, the tours expose visitors to North Georgia history. The ACCT certified guides will take you on a journey through time during your zip-line tour. Zip N Time has several different tour options, each offering a unique take on the zip lining experience. Some favorites include the Moonshine Canopy Tour, Goldmine Canopy Tour, Big Zip Intimidator and the Big Bear Canopy. There are the top five zip-line locations we recommend when taking your Helen Ga cabin rental getaway. Which of these zip lining tours sounds like the best fit for you and your family? A day out zip-lining, and you and your crew will find yourself exhausted. Make the trip to the bed a wonderful one. 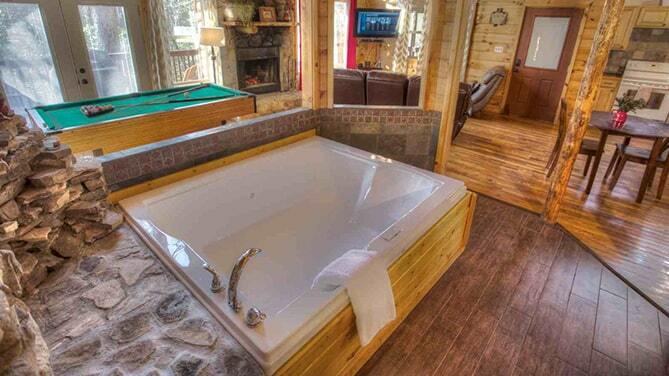 In fact, you could hit the hot tub before laying down in the comfortable beds of our cabins. Got it? Click here to view all of our cabins in Helen, GA. You'll be rejuvenated by the provided luxury for your next activity in north Georgia.